Tweety always enjoys the weekends. Invites to parties and clubs and fabulous restaurants always come pouring in! This weekend, while enjoying some Tweety caliber activities, Tweety's crew was so excited to see that, yet again, New York couldn't contain its admiration for our lovable little bird. 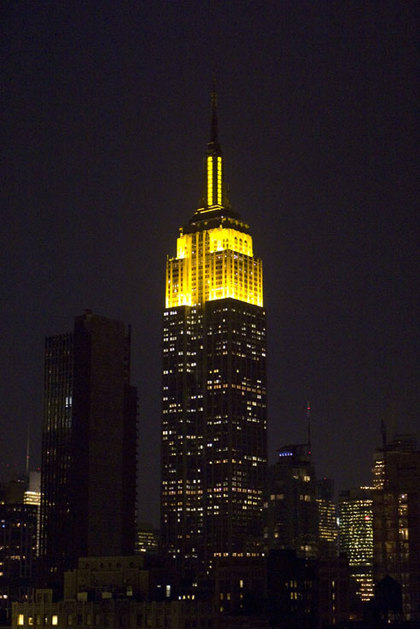 Declaring its love with a most opulent gesture, the Empire State Building was amped up to a glowing, Tweety yellow all weekend long, putting New Yorkers and out-of-towners alike in a festive Tweety mood. I Tawt I Taw a....Marathon?! While all of you Tweety fans out there know that the only running Tweety ever does is when being chased by that rascally puddy tat, Sylvester, Tweety is still very proud of and impressed by the thousands of people who completed the ING New York City Marathon yesterday. Tweety spent the gorgeous Sunday morning and early afternoon relaxing at a marathon party, and there was much excited wing flapping as the runnersâincluding women's winner Paula Radcliffe, the ultra-fit Lance Armstrong, and celebrity runner Katie Holmesâtrotted past Tweety's viewing perch. All of the finishers got their just award in the form of adulation and, of course, a yellow medal. Congratulations to all! Tweety Yellow: All the Halloween Rage! Tweety Makes Us Feel Like Dancing! We over here at Tweety Fine Jewelry HQ have always known that Tweety is quite the dancing machine. All one needs to do is check out the dancing Tweety charm to get some sort of indication of our feathered friend's sweetest moves. But we've heard through the rumor-mill that Tweety may soon be making a forray in the New York City nightclub scene. Details are still FUZZY, but we'll let you know as soon as a little birdy gives us some more information. Tweety Fine Jewelry landed at six Fortunoff stores recently, including their flagship Fifth Avenue Store, and New York City gave us the warmest welcome imaginable. 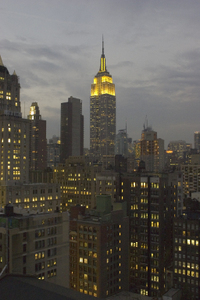 Seen from most points in our great city, the landmark Empire State Building glowed in Tweety Yellow on October 18, putting everyone in a Tweety mood and bringing smiles to the faces of Tweety Lovers everywhere. We're not at all surprised that the Empire State Building arranged such a grand reception; we here at Tweety see our beloved birdy in all things yellow and know that nothing is too good for Tweety. The electric yellow embrace is just another sign that, not only does Tweety ♥ New York, New York (and its well-heeled residents) ♥ Tweety! Stay tuned to our new Tweety Fine Jewelry blog to get information on Tweety happenings in New York and across the globe. TWEETY "fine jewelry for hot chicks"